Visible correction of up to 16 signs of aging just in 6 weeks! * Revives Youthful Firmness Brightens Age Spots Defines Contours Smoothes Lines Diminishes Wrinkles Unclogs & Minimizes Pores Comforts Sensitivity Evens Skin Tone Corrects Surface Imperfections Revives Clarity Replenishes Moisture Repairs Dryness Refines Texture Renews Softness Revitalizes Dullness Calms Redness RADICAL ANTI-AGING SYSTEM We infuse each formula of the Clinical Power Trio with a fine collection of high-functioning, eco-friendly ingredients and multi-action age-correcting technologies to reverse visible & textural aging on a global scale – regardless of age, ethnicity or skin condition. Results begin within minutes. KEY PERFORMANCE INGREDIENTS & TECHNOLOGIES Age-Repair Defensins Powerful, synthetically-produced messaging defensin peptides featuring a stand-alone breakthrough NATURAL mechanism of action. Patent-pending and EXCLUSIVELY available in DefenAge Skin Care. Niacinamide Soothes, revives skin’s natural moisture barrier, renews the feel of skin firmness and elasticity, brightens overall skin tone. Hyaluronic Acid-Liposome Encapsulated Promotes hydration and improves texture for remarkably smooth even skin. Sea Whip Keeps skin calm. Strongest, fastest, most effective soothing ingredient from the sea. Special “know-how”-protected fine blend of antioxidant- and hydrating technologies and enzymes. DefenAge products do NOT contain: Parabens or Formaldehyde-releasing preservatives, Sulfates, Irritating acids or Abrasives, Strong emulsifiers, Chemical sunscreens, Mineral oil, Petrolatum or Paraffin, Colorants, Phthalates, BPA, BHT/BHA, Propylene Glycol, Triethanolamine, Gluten Ingredients (no wheat, oats, barley). Free from Animal- or human- derived ingredients. Not tested on animals. Dermatologist-Tested. 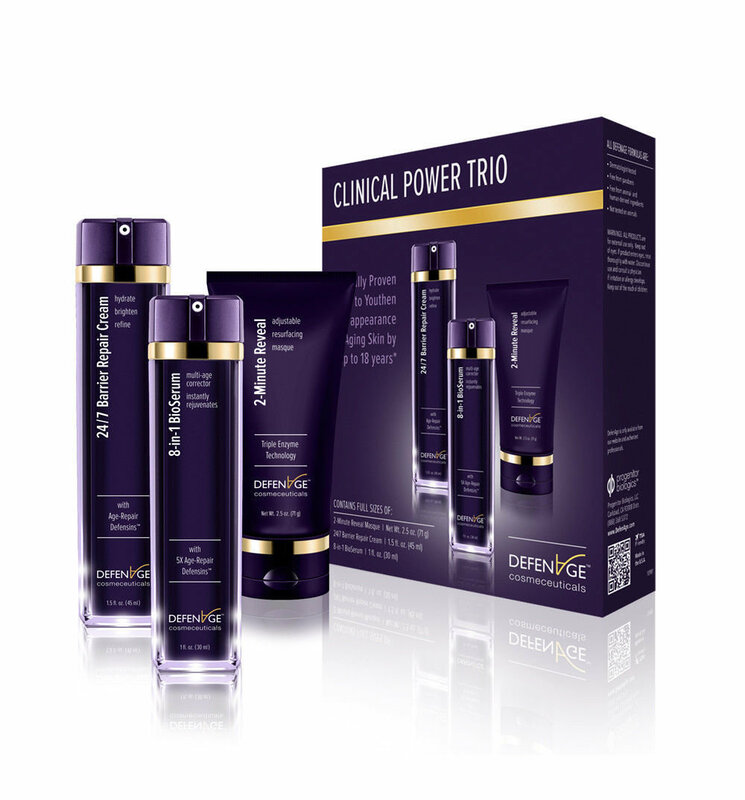 This 3 step skincare system uses the latest anti-aging technology to address 16 signs of aging. 8-in-1 BioSerum (1.0 oz. ): uses a blend of peptides, botanicals, and niacinamide, to smooth out wrinkles, brighten and firm skin. 24/7 Barrier Balance Cream (1.5 oz): Hydrates and nourishes skin, while repairing the skins natural barrier. 2-Minute Reveal Masque (2.5oz): Exfoliates and refines pores, using sugar crystals, natural extracts, fruit enzymes, and lactic acid. Europa Salon and Spa has professionals hailing from Europe and North America, our hair stylists, estheticians, massage therapists and nail technicians offer years of experience to their clients. Our salon hospitality will leave you feeling relaxed and pampered and our talented beauty team will have you looking your best. We are happy to provide tours of the facility, so drop by and see why so many Palm Coast residents choose Europa Salon and Spa for all their hair, skin, nail and body services. 5 Utility Dr. Ste 22. Palm Coast, FL, 32137.